These butter-like flavored tree nuts are loved by many because of their delicate taste and slightly soft texture. Cashews taste like butter, and are even a bit sweet, which makes for a creamy nut butter to spread across a piece of fruit. Cashews are commonly used in Indian cuisine as a paste for a curry, or to simply garnish a dish. Do you know how a cashew grows? Cashew trees produce both a cashew apple and a cashew nut. The cashew nut is attached to the bottom of the cashew apple, and is removed during harvesting. You may notice that cashews are not encased in a shell when sold in stores. The shell of a cashew contains a resin called cashew balm, and is not fit for consumption. This cashew balm is removed and can be used to make varnishes and insecticides. 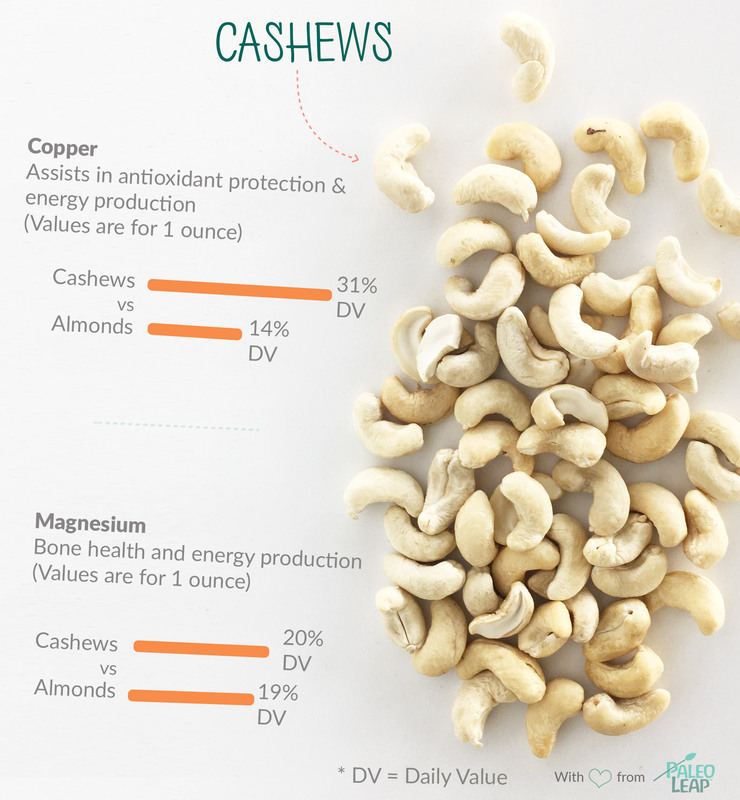 Orange dots show how 1 ounces of cashews fits into the typical nutrient profile of a Paleo meal. Purchase cashews at your local market year around. Buy raw cashews, then roast them to your liking. STORAGE: While cashews are more shelf-table than other nuts, cashews are best stored in an airtight container in a cool, dark place, like the refrigerator. ROASTED: Cashews can be eaten either raw or roasted. Oven-roast cashews for 15-20 minutes at 375 degrees F. Add salt and seasonings! ALLERGEN: Cashews are grown on trees and are classified as a tree nut; tree nuts are a common allergenic food. Process your own cashew butter: add cashews to a high-speed blender and blend slowly for 10 minutes. Add to a dessert recipe or serve on slices of banana. Make a non-dairy cheese from cashews. Add cashews to ginger, coconut aminos, garlic and seasonings to create a flavorful pad thai or chicken dish. Sprinkle a handful of chopped cashews to a fruit & nut mix, or on top of a fruit salad.